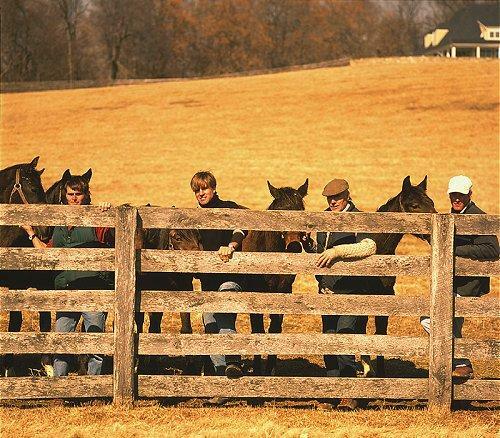 Maryland's Bonita Farm, a rare family-owned thoroughbred farm is home to three generations of the Boniface family who share in the toil and triumph of breeding, raising, and training what they hope will be champion racehorses. In this episode, Bill and Kevin begin training an unraced two-year-old colt named ASTRAL ASCENT. The son of the farm's Preakness champion DEPUTED TESTAMONY, they have high hopes for him. When the horse disappoints them during training at the farm, they decide that he may need the excitement of the racetrack to give him the spark he needs. So they take him to train at Delaware Park. While they're at the race track, ASTRAL also tries to earn his "gate card" - a license that all horses must have to be eligible to race - but he won't get it unless he can prove that he can stay calm and break away cleanly. Though hesitant at first, with a little help ASTRAL enters the gate. When it opens, he charges away like a true race horse and bolts around the track with such confidence that he has the family thinking that he might just have what it takes to follow in his fanous father's footsteps. Meanwhile, back at the farm, there's a new face in the barn. Bill's oldest daughter Kim is visiting. She lives in Kentucky where she's been trying to make it as a trainer on her own - a tough thing to do in a profession dominated by men. She's stopping by the farm for a few weeks with her stunning colt FIELD CAT before taking him to a race at Delaware Park. FIELD CAT is the kind of top quality horse that could catapult Kim's career if he can bring home the wins. Finally, viewers will be re-introduced to PATRICK, the year's tiniest foal whose life Billy saved at birth, as he faces a critical rite of passage - he's grown old enough to be weaned. In fact, he's made such great progress that Billy registers him as a true thoroughbred so he'll be eligible to race some day. It's a long-shot, but as Billy says, "he's a real fighter."